I found this sleeve in a charity shop, still with the shrink wrap on. Individually smart looking record sleeves are only beaten by sets of smart looking record sleeves in my book. There were four covers shown on the back, but only three had made it to the shop! I figured 3 our of 4 wasn’t bad, but as soon as I began looking into the designs I realised this was but the tip of the vinylite iceberg. A lot of Deutsche Grammophon covers are a bit ‘worthy’, and even when they’re not, the massive yellow logo tended to overwhelm the efforts of the designer. 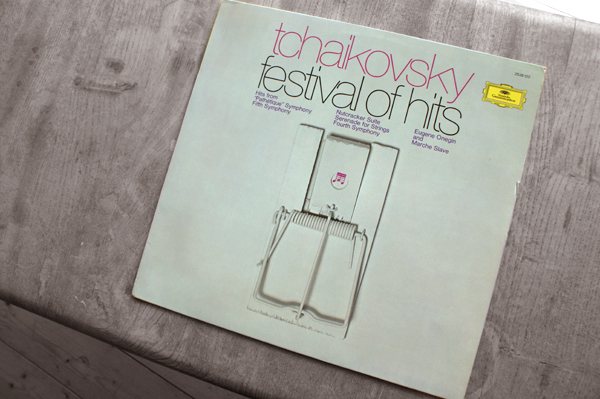 Here the label tried something different for a mid-price ‘Festival Of Hits‘ series, which sampled composers and recordings from their back catalogue. Which explains why the covers were not familiar to me back in Blighty. Cheekily Pollakis says he based one of the first three titles, Dances From The 16th Century, on the success of the James Last Non-Stop Dancing series (another Polydor label act)! 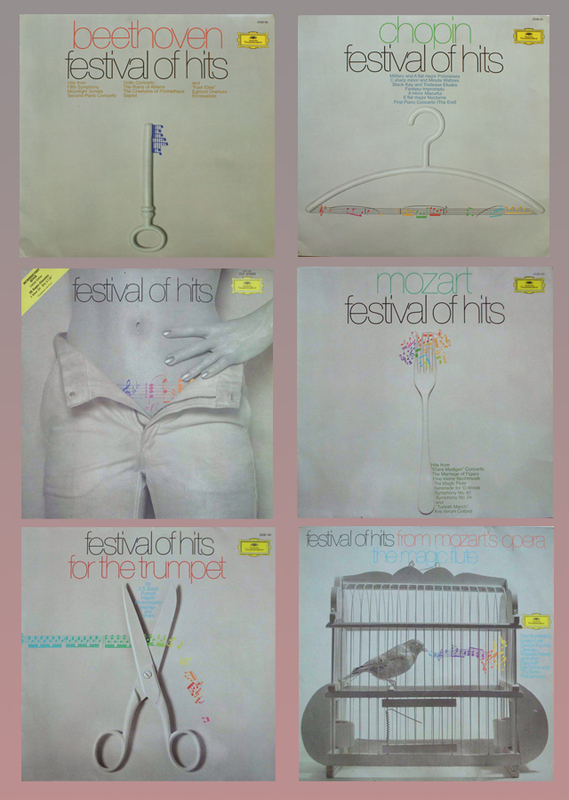 Festival of Hits was launched in the Autumn of 1974 with three titles. I’ve not been able to find out exactly how many they released, but the series was given a special catalogue sequence. If it started at 101, then over 80 albums were issued, all with the same cover theme. Some titles at least were later moved across to c*omp*ct d**c.
The idea of issuing a classical series in very non-traditional looking covers wasn’t entirely new; Westminster Gold was a staid American classical label which suddenly let designer Christopher Whorf loose on their sleeves, giving them a remarkable eye-catching make over which ran from 1970 up to 1975. It’s possible that Pollakis had spotted this work. Pollakis compiled the albums. DG’s head office in Hamburg organised the artwork and pressed the albums, which were shipped direct to Canada. Happily they also credited the designer, German-born Holgar Matthies. Matthies is one of the most respected of all post-war German poster designers. Born in 1940 he began work at a colour printers in 1957 and then went into graphic design in 1966. His poster work is now widely collected and has been exhibited in over 40 different countries but he also worked in many other media, though his album sleeve work seems less well known. Matthies did a number of covers for DG over the years, and managed to overcome the restrictions of their house style well on some of these. Other were clearly bread and butter jobs! But on the Festival series, he could make the SG logo more discreet and came up with a simple but clever generic look, which consisted of a household object sprayed up white and photographed against a white background. Over the photographic element coloured musical notes were introduced, usually in a playful manner. It was an idea which could be expanded to however many sleeves the series required. 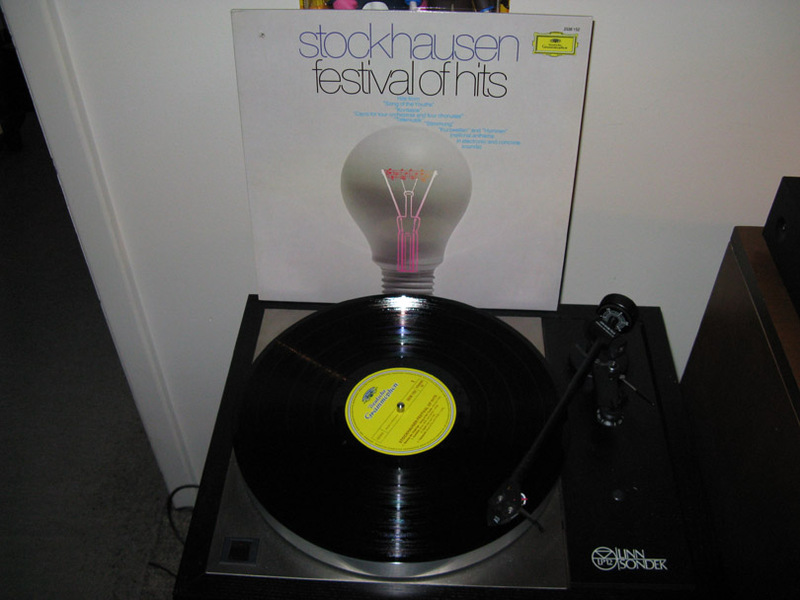 Cutlery, a purse, coathanger, mousetrap, even a lightbulb for Stockhausen (exactly which hits were these?!). Occasionally they got a bit carried away, such as with a birdcage complete with stuffed bird. There was also a double compilation sampler for the series, which had a female torso in a pair of unzipped jeans – with the musical notes spanning the gap; saucy. The composer and titles were writ large in lower case sans serif, with the DG logo in the corner or to the side. Overall the sleeves managed to avoid looking anything like a budget record. They sold well too and turn up for sale on a lot of North American sites. I’ve put half a dozen of the series on this page. Additional information : Alliance Graphique Internationale; Billboard magazine 1974. I have blogged the unusual KLM import stickers which were on the covers of these albums as well.